Recently, employees from the Devon depot of local foodservice provider, Bidfood, teamed up with the company’s food development team to organise a dysphagic food workshop. Dysphagia is the medical term for people who have swallowing difficulties. It commonly affects care home residents and often those struggling with advanced dementia. People who have dysphagia are often malnourished and can be dehydrated, so it is vital that care homes work to tackle this issue. The session for Somerset Redstone Trust involved educating chefs from some of their six care homes, on how to better their service offering for residents to help present food to be as appetising as possible. The workshop focused on how to improve presentation techniques of dysphagic food, as well as educating them to develop their knowledge of soft feeding. The session provided an in-depth insight into ‘dignity in dining’ for the residents, showcasing useful tips and tricks on how to cook the best food using Bidfood’s UK exclusive Gelea Hot. Gelea Hot is a gelling agent added to blended food to allow it to set in a mould. This enables chefs to recreate appetising dishes for residents that require a soft diet, but that still look visually appealing and like the original food. Angela Canham, Business Manager at Bidfood in Lee Mill, said: “There is an increasing amount of people in the UK who struggle with dysphagia on a daily basis, so it is vital that we use our resources to help support our customers in the best way possible, so they can look after their patients as best they can. During the session, Bidfood’s team demonstrated to the care home chefs how to create delicious breakfast dishes with Gelea Hot, as well as helping expand the chefs’ knowledge on dysphagia food descriptors and how to work with them. 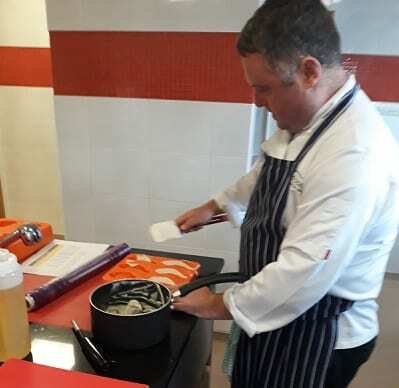 Wayne Wright, Development Chef at Bidfood said: “It is extremely important that care homes cater to people living with dysphagia, as it gives residents dignity in dining, from soft but rich and very nutritional foods. “Along with making sure the food is delicious, it is vital to ensure that it is safe for the residents to eat.